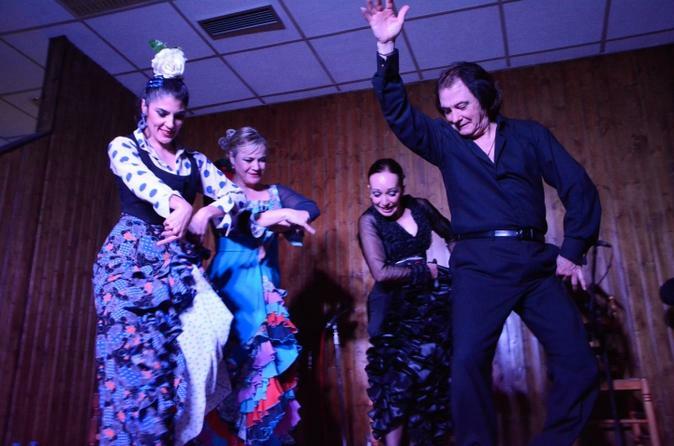 Experience the unique Flamenco show in the heart of Madrid's most flamenco-famous neighborhood. Go where the locals go to observe this incredible art up close, while enjoying a delicious dinner. The show comprises of a guitarist, singer and dancers, all of which have been selected from some of Madrid´s finest performers. The passion and intensity of this show is guaranteed to take your breath away and leave you tapping your toes for the rest of your visit. In the spring and summer months you can start your evening on the cool shady terrace sipping a cool beer or sangria, while watching the world go by. You are invited to join the fun workshop at 8:00pm. Try a few steps, play the cajón, dance with castanets, or just watch. Dinner is served at 9:00pm downstairs in the Tablao. We offer a set menu with a number of options to cater for different tastes.The food is freshly made on the premises, from the finest ingredients selected daily from the market.The menu always includes a variety of starters and main courses (meat or fish). You can request a dietary needs. The menu includes dessert and a drink of your choice. The professional flamenco show starts at about 10:15pm and is divided in two sets of approximately 40 minutes with a 10 minute break between them. The venue is designed in such a way to guarantee a good and front view of the stage. Hostess will be delighted to answer any questions you have about this incredible art form. (English and Spanish spoken). The night ends at about midnight leaving plenty of time to take the public transport. Unless you want to stay a little longer and dance with the locals until early morning.